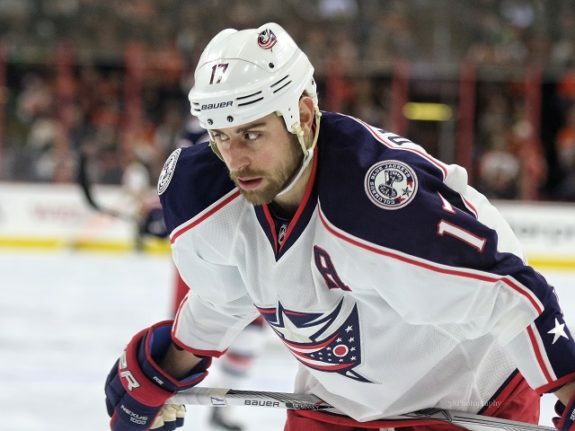 The Columbus Blue Jackets announced on Wednesday that center Brandon Dubinsky will miss 6-8 weeks with an orbital bone fracture. This is as crushing a loss for a team already struggling at center as you can see. But life goes on. The Blue Jackets must continue without Dubinsky. That means one thing. Alexander Wennberg must start playing the way he is capable of. Recall Wennberg signed a new six-year deal with the Blue Jackets before the season started. The expectation for him was to perform as a top-six center. With questions at center below him, his success was of the utmost importance to the Blue Jackets. His start has been anything but successful in the early going with just two goals and 11 points in 25 games. Now that Dubinsky is out, Wennberg must step up. No player will get more scrutiny in the next 6-8 weeks than Wennberg. One night after an embarrassing 7-2 loss to the Edmonton Oilers, the Blue Jackets took to the ice in preparations for their game Thursday against the New York Islanders. Without Dubinsky, Wennberg skated on a line with Boone Jenner and Cam Atkinson. This is the first time all season this trio will skate together. If the Blue Jackets hope to find success, they must find a way to make things happen if the top line of Artemi Panarin, Pierre-Luc Dubois and Josh Anderson get held in check. Wennberg in particular needs to show consistency. Wennberg broke through Friday night in New Jersey by scoring an important power-play goal. With three shots on goal and almost 20 minutes of ice time, maybe this was the thing that would kick-start him. However, Wennberg followed that up with no points and just one shot in over 33 minutes in his last two games. When he is right, he is a dynamic play maker who can make plays happen. His ability to find chemistry will go a long way in determining how this stretch without Dubinsky will go. Will Columbus Make a Trade? With their best faceoff guy in Dubinsky out, will the Blue Jackets look for external help at center? Considering that Dubinsky is by far their best faceoff player, the team will miss his play at both ends of the ice, especially gaining puck possession after the draw. To put this in perspective, the Blue Jackets win just 47.1% of their faceoffs. Dubinsky wins 54% of his draws. Without him, they will struggle gaining early possession. Although it’s not the end-all, it puts an extra amount of pressure not only on the other centers to win more draws, it puts pressure on the team to gain possession after a lost draw more often. This is where a Wennberg resurgence is of utmost importance. If he can find his game, the team can make it through Dubinsky’s absence with minimal damage. Otherwise the team might need to look outside for help. We will see very early how Wennberg responds to the spotlight. He will get more minutes in important situations. Can he find a way to bring back memories of early last season when he was a point per game player? The Blue Jackets need him more than ever now. If he responds, great. If not, a trade is not out of the question. In fact, the Blue Jackets will have no choice but to look externally if Wennberg struggles. The best acquisition the Blue Jackets can make is a revitalized Wennberg. Now’s your chance, Alex. The Blue Jackets need you more than ever.